In 63 BC, Romans incorporated Judah (what is now Palestine) into their empire as Judea and placed the Jewish lands under kings. Appointed to these kingships was the Herod dynasty, a family of Jews who gained favor with the Romans. The Herodian family ruled over the Palestinian area from 40 BC until around AD 100. The most significant member of this famiy was Herod the Great, who ruled from 37 to 4 BC. Herod rebuilt many fortresses in the land and temples in Gentile territories. He rebuilt Stato's Tower, renamed Caesarea, and in 24 BC he built for himself a royal palace in Jerusalem. But his most notable achievement was the building a temple in Jerusalem, which was begun in 20/19 BC and finished in 63 AD, long after his death in 4 BC. This was known as the Third Temple. Rebuilding the temple started in 20 BC. Herod used the same type of soft white stones that were used for Solomon's Temple. There were 10,000 workmen, and 1,000 of them were priests trained as carpenters since the law prohibited laymen from entering the temple itself. They shaped the stones a few hundred feet away to prevent noise around the Holy Place. The entire complex was enclosed in the Court of the Gentiles, represented today by the great platform of the Haram al-Sherif. The Court of the Gentiles covered about 35 acres which is much larger than the court of the previous temple, and it was extended from its former square shape and made into a huge rectangle, paved and enclosed by a wall on all four sides. Greco-Roman Corinthian columns surrounded the interior. On the south side of the interior, Herod erected a triple colonnade extending 800 feet called the Royal Portico. It was given this name because it was the place where Solomon was crowned. Inside the Court of the Gentiles was the Court of Women, which represented the point at which women could not pass. The Court of Women led into the Court of Israel, or Court of Men, and any male Jew was allowed in this area. Inside the Court of Men was the Court of the Priests, which housed the sacrificial altar. The Sanctuary, in the back of the Court of the Priests, had two chambers. The first was the holy place, which held the table of shewbread and the Menorah. The second chamber, the Holy of Holies was set apart by two curtains, and was only entered by the High Priest once a year, on Yom Kippur, the day of atonement. To the north, a deep valley between the temple area and the Antonia Castle (northwest corner) was filled in to make the extension of the temple mount possible. A second tower was added at the northeast corner called the Golden Gate. On the West Side of the precinct, parts of the enclosure wall still stand, forming the nine lowest levels of the Western Wall (Wailing Wall). Jews came to offer their prayers here. The Pinnacle, which was the summit of the enclosure wall at the southeastern corner, was at a height of 450 feet above the level of the Kidron Valley. The vaults known as Solomon Stables are situated below the Pinnacle. The southern side of the precinct was supported by a massive structure built into the hill. The largest of its stone blocks is more than 16 feet long and can be seen from the opposite side of the valley. It was reached by ramps leading upward from the Triple and Double Gates. The construction of the temple ended in 63 AD, long after Herod grew ill and died at Jericho in the spring of 4 BC. The people made Archelaus their king because that was what was put in Herod's last (sixth) will. It was under Archelaus's direction that the rebuilding of the temple was finished. Dictionary of Jesus and the Gospels. Ed. McKnight. InterVarsity Press. IL, 1992. Israel: Past and Present. Macmillan Travel. NY, 1998. Grant, Michael. Herod the Great. American Heritage Press. New York. Matthews, Roy T. The Western Humanities. Mayfield Publishing Company. CA, 1998. The Student Bible. Ed. Yancey. Zondervan Publishing House. MI, 1986. 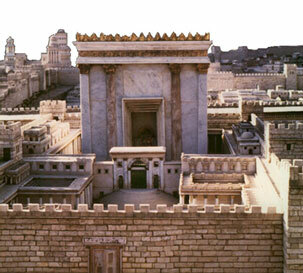 The photograph is of a model of Herod's Temple at the Holyland Hotel in Jerusalem. The image is from http://www.stolaf.edu/people/kchanson/temple.html, part of the website Palestine in the Time of Jesus http://www.stolaf.edu/people/kchanson/ptj.html copyright by K. C. Hanson. Used by permission.